Create professional business proposals with QuickBooks. Land the job with a strong business proposal. Small business owners often provide a business proposal to a potential client before starting a project. A business proposal details how much a project will cost the potential client and includes a proposed solution based on the client’s needs. It states the price for each component such as goods, materials, tax, labor, and subcontractor fees. Like a resume for a job-seeker, a business proposal is often the first formal document a potential client may see from your business. To make a good impression, it should convey professionalism combined with more information detailing the strengths of your business. It must not only outline how you will solve the client’s problem, but should also demonstrate how you work. While a business proposal is not binding, once it’s accepted by the client it is typically considered an ‘agreed upon contract.’ From here, the project will usually begin on the terms set out in the proposal. Therefore, it’s crucial that each business proposal represents an accurate estimate of the scope of the project, including pricing information for materials and the cost of labor. Manage business proposals your way. 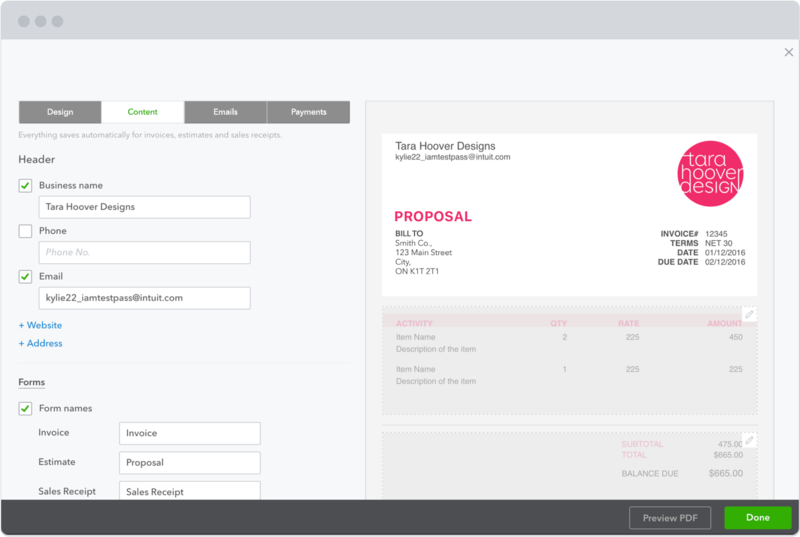 Easily create a business proposal via the ‘Estimates’ feature in QuickBooks. You can customize our pre-built business proposal template to represent your business and to include the components of your proposed solution. Save your custom proposal template to make creating future business proposals for new clients fast and easy. Once a business proposal is accepted, you can choose how to invoice. Some small businesses choose to take a deposit at the beginning of a project and payment at the end. Others choose to get paid as they work by billing incrementally throughout the project. QuickBooks makes it easy to split the business proposal into multiple invoices based on project milestones, stages, or the percentage of work complete. Once the business proposal is accepted and the work begins, you can track the entire project from start to finish*. Tag invoices, expenses, billable and non-billable hours, and incoming payments to a specific project. Get a bird’s-eye view of the project to know how you’re tracking to the business proposal, which expenses have been paid, how many hours you’ve worked on the project, and more. More than just business proposals. Run your entire business with QuickBooks. For many long-term projects, it’s common to incur expenses that you later include on client invoices for reimbursement. With QuickBooks, it’s easy to keep track of expenses and attach receipts to invoices. Simply snap a photo of the receipt, tag it to the client’s project, then attach it to the invoice. Use your phone or tablet to enter transactions, record expenses, invoice customers, send reports, and more – from anywhere. QuickBooks automatically backs up your data to the cloud and syncs across all your devices. If you need extra capital for up-front costs on a project, QuickBooks can help. We use the financial data you already track in QuickBooks to help you apply for a small business loan. We pre-fill your loan application and send it to our trusted partners. Watch this video to see how to create business proposals with QuickBooks. What are the components of a business proposal?